The Remarkable Rocks in the Flinders Chase National Park on Kangaroo Island, SA, Australia have been weathered into strange and unique shapes - many visitors enjoy picking out familiar objects in the formations, such as giant chairs and hooks. Enhancing their beauty are the colours in the granite uncovered as the rocks are worn down - blues, blacks and pinks play across the surface of the rocks. This image belongs to the travel and nature stock photo library. This stock photo of Vivid Sunrise at The Remarkable Rocks is available for licensing for commercial and editorial uses including websites, blogs, books, magazines, brochures and advertising. Restrictions may apply for images which contain third party copyrighted material or sensitive subjects. Photos of artwork are for editorial use only. 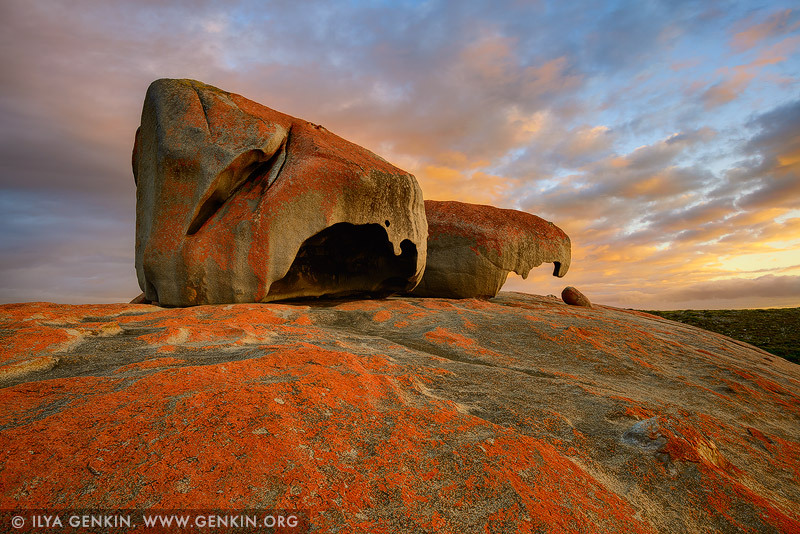 This image id KI-REMARKABLE-ROCKS-0002 of Vivid Sunrise at The Remarkable Rocks, is copyrighted © by Ilya Genkin. This is not a public domain image.